NEW ORLEANS – If you’re looking for continuity, don’t expect to find it in the NCAA Division III Men’s Indoor Track & Field National Team Computer Rankings. 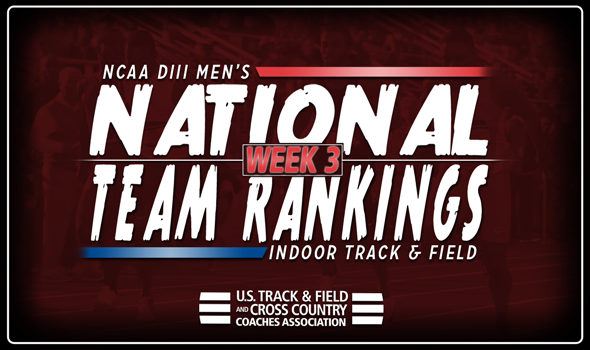 Yet another week saw a bunch of changes in the top-25 as 20 of the 25 teams in Week 2 didn’t stay in place when the Week 3 index was released Tuesday by the U.S. Track & Field and Cross Country Coaches Association (USTFCCCA). North Central (Ill.), MIT, UW-La Crosse and UW-Oshkosh are still the top-4 teams. The only thing that changed was the order behind the Cardinals. The Eagles jumped ahead of the Engineers after Ernest Winters turned in a blistering time of 21.53 in the 200, which ranks him on top of the NCAA DIII Descending Order List. Benedictine (Ill.) is back in the top-5 after a two-spot jump from Week 2. The Eagles saw Jordan Johnson – who was already one of the top men in the nation at 60 meters – improve his standing in the 200 following his effort of 21.73. Christopher Newport is inches away from being ranked in the top-5 for the second time in program history, but it has to settle for sixth this week. The Captains are led by two top marks on the NCAA DIII Descending Order List from Jeffrey Dover (mile) and Grayson Reid (5000) and added the No. 2 spot in the distance medley relay (10:02.71). Haverford jumped seven spots from No. 18 to No. 11. The Fords got another great outing from Dylan Gearinger, who is now No. 2 on the Descending Order List in the 5000 and No. 2 in the USTFCCCA Individual Rankings in the 3000. Greg Morgan and Graham Peet helped Haverford out in the mile and 5000, respectively, as well. Four teams in the bottom half of the index vaulted five or more spots: UW-Stout, Central (Iowa), SUNY Geneseo and Tufts. The Blue Devils went from No. 22 to No. 17. The Dutch climbed seven spots from No. 25 to No. 18. The Knights bolted from No. 45 to No. 21 and the Jumbos are now ranked 22nd after being 34th last week.